Definition at line 26 of file DispatcherPowerpc.h. Definition at line 80 of file DispatcherPowerpc.h. Definition at line 85 of file DispatcherPowerpc.h. Definition at line 91 of file DispatcherPowerpc.h. 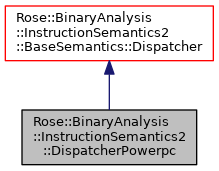 Definition at line 101 of file DispatcherPowerpc.h. Definition at line 113 of file DispatcherPowerpc.h. Definition at line 33 of file DispatcherPowerpc.h.